Opps! It must be my age or maybe I was sleep walking that night. 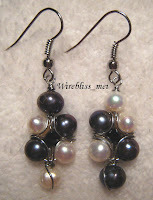 I actually took picture of the pearl flower earring set made for my sister in-law. Found it a while ago when i checked the camera....."shy! shy!" I hope you will continue making many more beautiful designs and perhaps one day I shall sell my own designs too. All the best from another fellow Malaysian! Thanks miszmilk! There will be more to come...but rather slowly. Happy to hear from another fellow Malaysian sharing similar interest. Hope you will post some of your creations on your blog.